AMBON (INDONESIA) - I awoke after midnight to the light of the full moon shining like a beacon across the water and into my bedroom, swaying in the middle of the Banda Sea. Outside, there were no boats or any land to be seen for hours as Rascal, a 30m phinisi yacht hand-crafted from teak and ironwood, slowly sailed 185kmh through the dark. We were on course to arrive in the Banda Islands at the farthest reaches of east Indonesia's Maluku archipelago by morning. Historically known as the Spice Islands, the coveted source of nutmeg, mace and cloves, my friends and I had flown for over nine hours from Singapore and landed the day before in the small chaotic airport of Ambon, the Maluku capital. The humid air was heady with the aromatic smoke of the clove cigarettes which dangled from the fingers and lips of every porter and taxi driver jostling for work. 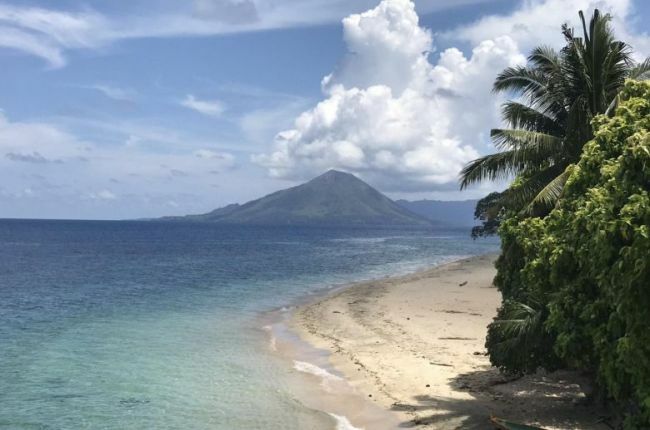 It already felt deliciously exotic amid the sounds and smells and encircling jungle, but we had hours of travel to go before we would anchor at our final destination - Banda Neira and the remote chain of islands which changed the course of history. Fortunately, we had the ideal mode of transport. There are worse ways to make an ocean crossing than aboard the Rascal, with five spacious air-conditioned ensuite cabins fit for a five-star hotel, ample deck space, excellent multi-course meals and more staff than guests. Despite the comfort of my room, I found myself tossing and turning in my king-size bed, restless with the nerves of a virgin seafarer. So, just after dawn, I made my way to the front deck and fell into a seat in front of the deckhouse to enjoy the thrill of the ride; the wind in my hair, the deep drum and swish of waves washing the bow, its undulating pitch and plunge followed by the pitch and plunge of my stomach. And, quite suddenly, I could see the classic cone of Gunung Api, one of the Banda Islands' active volcanoes, emerge on the horizon. How fitting to approach Banda by boat and feel the palpable passage of distance and time, just as the first European explorers did 500 years ago. As we neared Banda Neira, my fellow guests and I crowded around the foredeck to soak in the drama of sailing beneath the verdant volcano, past swaying palm trees and the black slice of a hardened lava flow and into the island's natural harbour. It is the perfect, and practically the only, way to get to the group of 10 volcanic islands more than 965km from Australia, its nearest land mass. Because of its isolation, few travellers venture here - for the four days, we were at anchor, there were only two or three other chartered vessels like ours. Most were liveaboard boats which brought guests to dive and snorkel the islands' pristine and flourishing reefs, teeming with soft, feathery corals and fluorescent fish. My friends and I snorkelled and went diving at least once a day during our five-day trip and were never disappointed. From vivid striped wrasse and surgeonfish to sea snakes and moray eels, we easily saw thousands of fish in the clear blue waters with incredible visibility. Each time, we were the only people on the reef. On our last dive, three of my friends came to the surface breathless with excitement, having seen eight moray eels and huge schools of hundreds of fish in just 20 minutes underwater. "We didn't want to come up," they said. "It was one of the best dives we've ever had." In the mornings, while some guests ventured off to explore the shoreline on Rascal's stand-up paddleboards and kayaks, I stayed on the deck for a while, listening to the sound of birds chirping in the forest as the morning's mist disperses above the mountainside. Occasionally, a rooster crowed and a traditional fishing boat, long and thin like a canoe, loudly motored past. Otherwise, it was completely quiet. As I sipped my tea, graciously brought to me by one of the Rascal crew, it was hard to believe these peaceful islands were once a place that nations went to war over, that thousands of men died for. Or, more specifically, for a little brown nut. Until the mid-19th century, the Banda Islands were the only source of nutmeg and mace in the world. It was so valuable for its use as food flavouring, preservation and medicine - some Elizabethan physicians claimed nutmeg could cure the plague - that it was once worth its weight in gold. Hoping to circumvent Asian and Arab traders, it was in search of these islands that Portuguese, Dutch and English explorers sailed from home in the 16th and 17th centuries and went to war with one another to claim the riches for themselves. And it was in the hope of finding a shorter route to these very islands that explorers like Christopher Columbus and Ferdinand Magellan sailed west, inadvertently discovering the Americas, the new world. Control over the Banda was so important that, in 1667, the Dutch traded Manhattan for Run, one of the smallest and westernmost islands in the chain. The Portuguese were the first Europeans to arrive in 1511, but the Dutch were dominant here, controlling most of the Banda Islands from the early 1600s until the early 1900s. Small and dilapidated Banda Neira was and still is the largest settlement in the islands and the Dutch's 17th-century hilltop Fort Belgica still stands, as does the former Dutch governor's residence, now empty and abandoned. On a tour of the fort, while admiring the idyllic views of the town and volcano beyond, a Bandanese man in his 40s approached us. In his hands, he held dozens of rusted and tarnished old coins dating as far back as 1746 which he was selling for 300,000 rupiah (S$28) each. "I collect them around the fort and around the island," he said. Do people buy them? I asked. "Oh, yes, the tourists, especially the Dutch." The next day, we made our way to Pulau Ai, sailing an hour and a half to the west. When a pod of dolphins joined us for the ride, their silver forms leaping and playing along the bow, I knew it was a sign of something magical ahead. We were greeted onshore by Mr Ayam, proprietor of the island's Green Coconut Guesthouse, a bright yellow villa perched on the waterfront, who immediately made us feel at home. Mr Ayam and his family have around 700 nutmeg trees on the island, and spread across his doorstep are a handful of mats covered in freshly harvested mace and nutmeg drying in the sun. "There are more nutmeg trees here than on Run. Almost everyone works in nutmeg," he said as he took us on a tour of the well maintained village, leading us along a paved pathway past brightly painted houses in pale yellows, pinks and greens, most with satellite dishes on their rooftops. As we made our way to 17th- century Fort Revenge which was built by the British, and the remains of an old Dutch cemetery, I saw fruit trees everywhere. Papaya, pomegranate, avocados and bananas were growing in abundance. Mr Ayam said there is no underground water on the island. Everyone collects rainwater to drink, bathe and flush toilets, yet everything grows as if this was the garden of Eden. We walked past orchards of clove trees and towering almond ones, estimated to be about 500 years old, with enormous buttress roots more than twice the height of a grown man. At a nutmeg grove, Mr Ayam showed us how they harvest the nutmeg fruit, round and pale green like an unripened plum, using a long bamboo stick with a hook at the end. "We do everything by hand," he said, expertly extending the stick into the highest branches and, with a single tug, felling the fruit to the ground. Using a knife, he opened the fruit and there, in the middle, was the chocolate-coloured nut surrounded by a fiery red net of mace. They sell 1kg of dried nutmeg, about 200 to 300 pieces, for 200,000 rupiah. That is less than $20. I was gobsmacked at the price of the spice, which costs $10 for two or three pieces at the supermarket. It might not be worth its weight in gold any more, but international spice traders are still making a killing on nutmeg. Making our way back to the boat, we learnt that Mr Ayam's friend had caught some giant lobsters on the reef, each longer and twice as thick as my forearm, and we bought three for less than $50. I wondered, has there ever been an island more plentiful than Ai? On our last morning in Banda Neira, the Rascal crew arranged a special send-off to start our journey home. Two kora kora, traditional Bandanese war canoes, raced us out of the harbour, 30 men in each boat paddling to the steady beat of a drum. We were chugging along nicely when some of the men started shouting, "Gas! Gas! ", and they were off, paddling furiously and with surprising speed as our captain cranked the engines to keep up. They were charging ahead at close to 10 knots. It was an exhilarating race and everyone on board the Rascal and the kora kora clapped and cheered as we neared an invisible finish line. One of the men on the kora kora shouted something to us in Bahasa and Kina, the Rascal dive master, translated. "They are saying, see you tomorrow," she said, as we pulled out into the open sea. How I wished that was true. • This trip was sponsored by Rascal Voyages. • Lydia Vasko, a former journalist at The Straits Times, is a freelance travel writer.